Although our RV adventure didn’t begin until October 2015, we had begun talking about it several years before. While we appreciated the steady income that our jobs provided, we were increasingly less satisfied by the “sameness” that we sensed with each passing year. Mondays were harder to face each week. Returning from vacations would only fill us with the desire to be on vacation again. Phil couldn’t stand his boss and Jan, although appreciative of being allowed to work from home by her client, was ready for a new chapter in her life. We were both in our 50s but increasingly found ourselves talking about what we would do when we retired. Since we both enjoyed traveling and had no family ties to the Chicago area, we often kicked around the idea of getting an RV and touring the country. But since neither of us had much recent camping or RVing experience, we knew we had a lot to learn before we could venture off on the road. Fortunately, the Internet holds a tremendous amount of information that was helpful in charting our course to the RV lifestyle. Most of this information was encouraging but there was also no shortage of stories concerning what could go wrong, sometimes disastrously so. 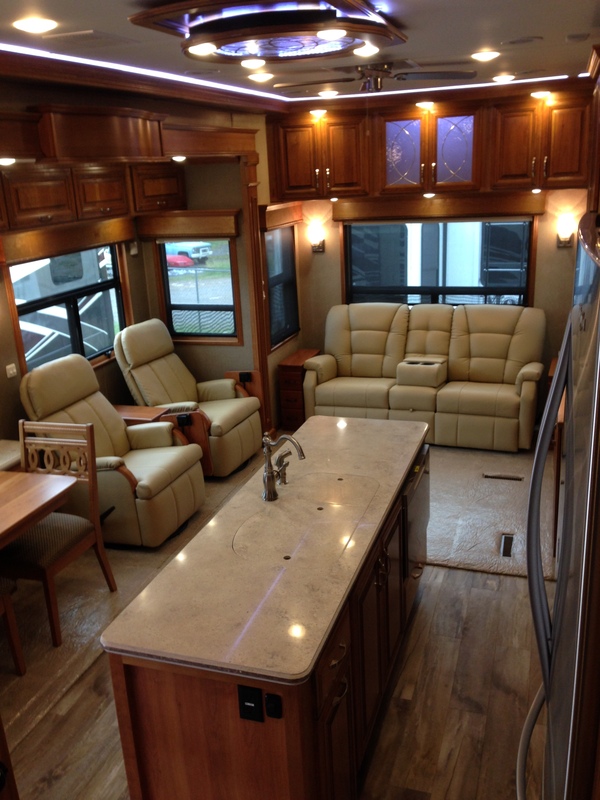 There are numerous free RV websites that include discussion forums on a wide array of subjects. When we had a question, we’d post the question on one of these forums and we could count on getting multiple responses within a day or two. Two of the organizations we found particularly helpful were Workamper News (www.workamper.com) and Escapees (www.escapees.com). Workamper News focuses on ways to earn some income while living in an RV. Workamper News provides a means to connect individuals seeking workamping employment with employers seeking workampers. Since neither of us was close to 65 when we began our dream, we found this information very helpful in finding out about opportunities to make a little money while camping. Although a small percentage of workampers pursue high paying jobs while on the road, most workamping jobs are simply ways to supplement income or, at a minimum, get our campsite paid for. We began our membership in Workamper News as “dreamers” but found these resources so valuable that we enrolled as “lifetime Gold members” when the opportunity arose. We continue to sign up for the monthly “Gold member roundtable” and “Ask the Expert” online webinars. Although we haven’t been in a position to share our experience yet, we hope to be in a position to do so in the future. Escapees is an organization dedicated to serving the needs of RVers. A large percentage of Escapees members are full-timers so we were able to learn from the Escapees resources about how we would deal with the various issues related to not having a “sticks and bricks” home. In September 2012, we attended the Escapees RV Boot Camp in Sedalia, MO. The 3-day Boot Camp touched on all aspects of RVing from hitch-up tips and techniques to RV systems, driving skills, weight and tire safety, ﬁre and life safety, and more. Escapees also holds annual Escapades which are rallies at which over 1,000 RVers and dreamers attend for five days of seminars, entertainment and fellowship. We attended Escapades in July 2013 in Gillette, WY and in March 2015 in Tucson, AZ. One of the first things we learned about RVing was the variety of types of RVs and the large number of manufacturers of each type. We attended all the RV shows we could find close to home. Each February, we attended the Chicago RV show and then attended the Milwaukee RV show the following week. 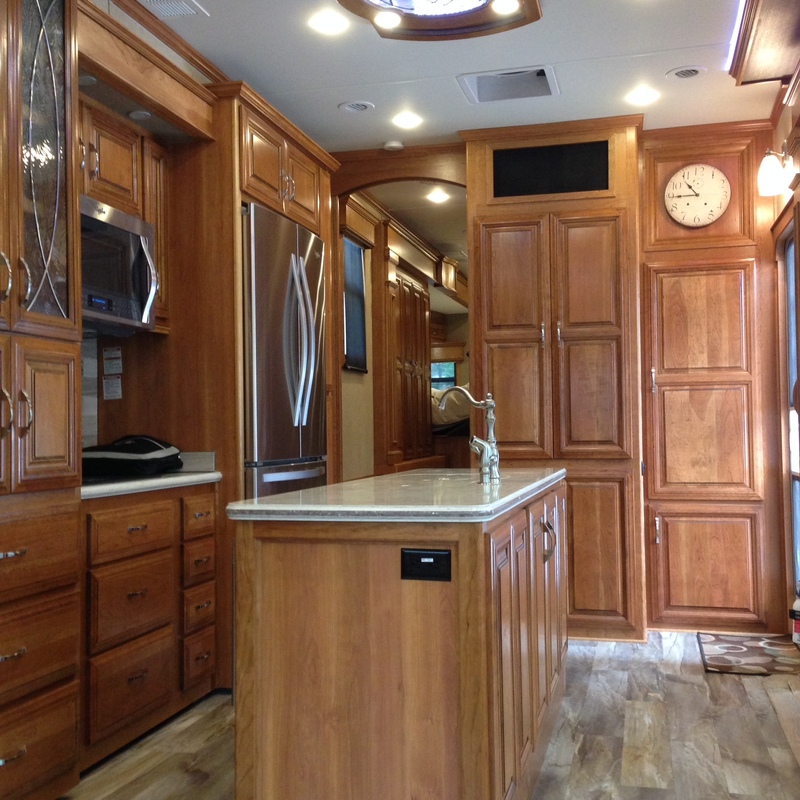 In January 2015, we attended the Tampa RV Supershow, one of the biggest collections of RVs at a single site. We began with the idea that we would buy a motorhome (correctly referred to as a Class A) but ultimately decided on a fifth wheel. 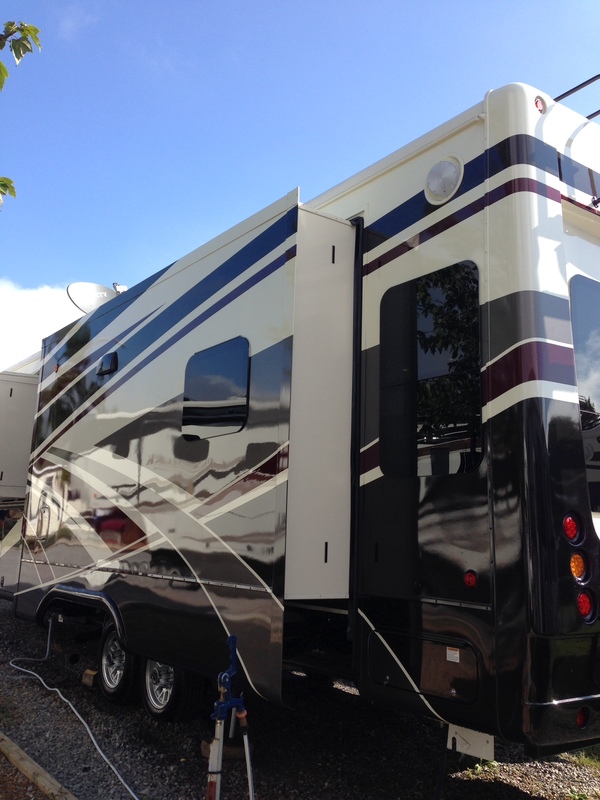 There are pros and cons to each type of RV but, given that we plan to stay in a location for extended periods of time, we decided that the roominess of the fifth wheels was the most important to us. 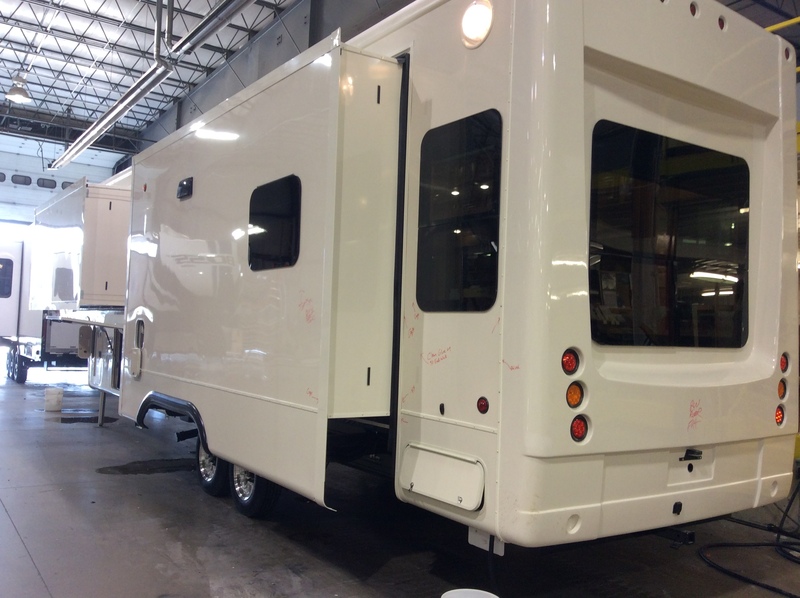 Since we intend to full-time in our fifth wheel, it was important to get one that was built for full-time use. We read all the RV reviews and owner feedback we could find and narrowed our search down to a few manufacturers. As would be expected, the higher quality fifth wheels were also the most expensive. New Horizons custom manufactures some amazing fifth wheels but they were well above our price range. That left us with three manufacturers that we considered: DRV, Excel and NuWa. We also considered Redwoods but, although they had beautiful interiors, they were not built as solidly as the others. Excel and NuWa were both manufactured in Kansas so, in conjunction with our attendance at the RV Boot Camp in Sedalia, MO, we decided to tour the two Kansas factories. Unfortunately, NuWa went out of business two weeks before we were planning to visit them. We did tour the Excel facility in Smith Center, KS and, although we were impressed with the quality of their construction, we were concerned with the lack of Excel dealers outside of the Midwest. That left us focused on DRV. In hindsight that was a good decision since Excel went out of business in early 2015. Unfortunately, due to the fact that most DRV’s are built to order, it was difficult to find a DRV dealer that had much of a variety in stock. The Milwaukee RV show generally had one model on display and there were generally no DRV’s at the Chicago RV show. We visited the Brown & Brown dealership in Bourbonnais, IL in 2012 but, although the salesman was very helpful, they only had one DRV Mobile Suites on the lot. We toured the DRV factory in the fall of 2013 and were impressed with what we saw. The Tampa Supershow was the first opportunity we had to view a large selection of DRV models at one place and to get a lot of questions answered. We spent a large part of two days at the DRV exhibit and got a great deal of input on various options we ultimately included in our build sheet. 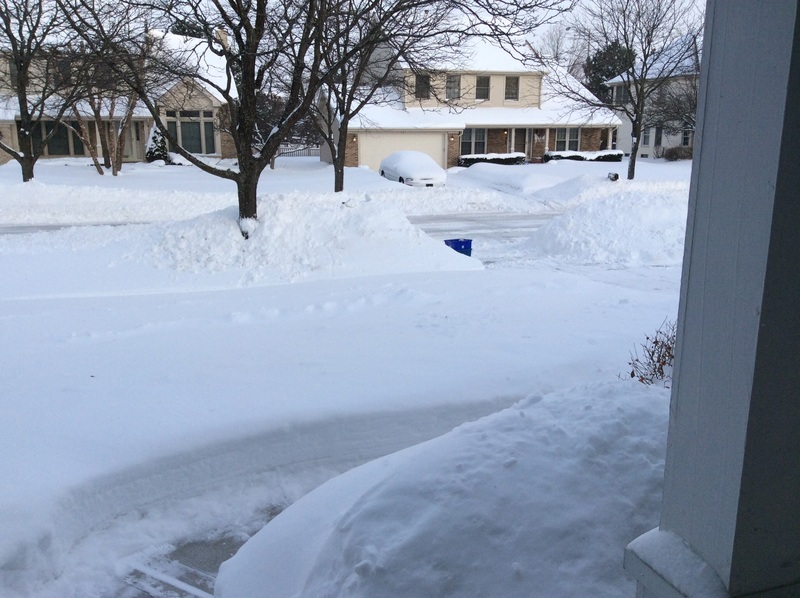 The winter of 2014-2015 was a bitterly cold one, the second one in a row in the Chicago area. Phil constantly asked Jan to explain why we were living in the north and she had no good answer. By that point, both of us were working as contractors. Phil had been working for the Internal Audit department of the Chicago Transit Authority (CTA) since May 2014 and Jan was still working from home. Phil spent many hours analyzing whether we could afford to quit working and begin a life of full-time RVing. Although there were many assumptions that had to be made in the analysis, the figures consistently showed that we were financially prepared to begin the dream now, rather than waiting until normal retirement age. Ultimately, we decided that we would put our house on the market the next time we were both unemployed at the same time. That date arrived in April 2015 when, due to the election of a Republican governor in Illinois, the CTA’s budget was cut and they could no longer afford to keep me on as a consultant. Although Jan went back to work from home in May 2015, the decision was made and we began to take the necessary steps. Although we had a pretty good idea about all the steps we needed to take to get us to full-time RVer status, the real challenge was figuring out the sequence and timing for each of the steps. The biggest unknown was how long it would take to sell our house. It had taken us seven months to sell the last one. Since we weren’t allowed to park an RV in our driveway in our subdivision, we really didn’t want to buy it before we felt confident that the house was sold. Phil had been analyzing truck options for several years. Since the DRV model we had decided on has a gross weight of 19,000 lbs., the truck was going to have to be a 1 ton diesel dually, regardless of brand. After looking at Ford F450’s for a long time, Phil finally decided to go with a RAM 3500 instead. He had planned to buy a slightly used truck but couldn’t find one for the right price. Since the truck will be used almost solely for towing and we don’t plan to move very often, we didn’t need a truck that was loaded with options but did need some very specific specs for towing. Phil used the ramtrucks.com website to build and price the dream truck with exactly the specs we wanted. In early May, Phil began to search the nationwide inventories of RAM 3500’s with our desired specs but with no success. He had decided to simply order it from the factory but then discovered that RAM was no longer taking orders for the 2015 model year and the 2016 models wouldn’t be available until the end of August at the earliest. 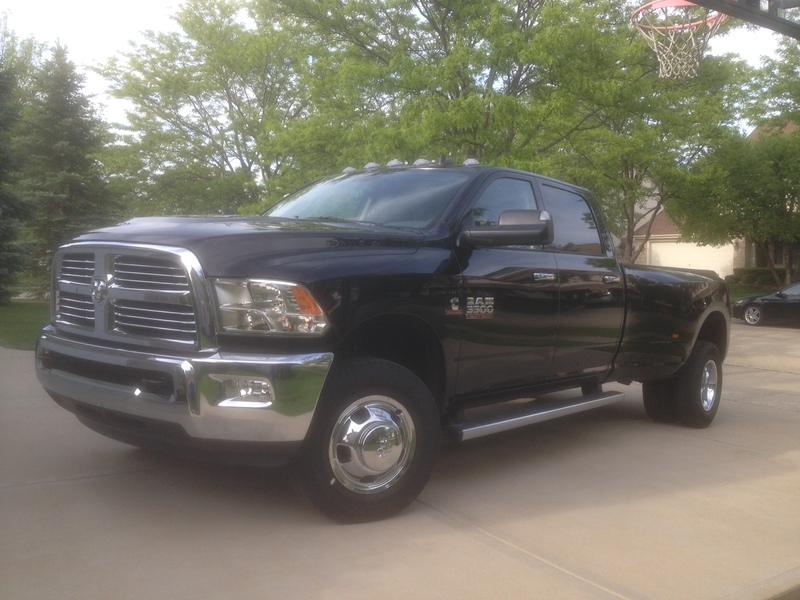 After an unsuccessful trip to the RAM dealer in Schaumburg, on May 20th Phil found a listing for a 2015 RAM 3500 with nearly the exact specs we wanted in the city of Chicago. Test driving a dually on city streets was a little scary but ultimately Phil decided to buy it on the spot. He did get the dealer to deliver the truck to our home, though, rather than have to drive it through the city himself. 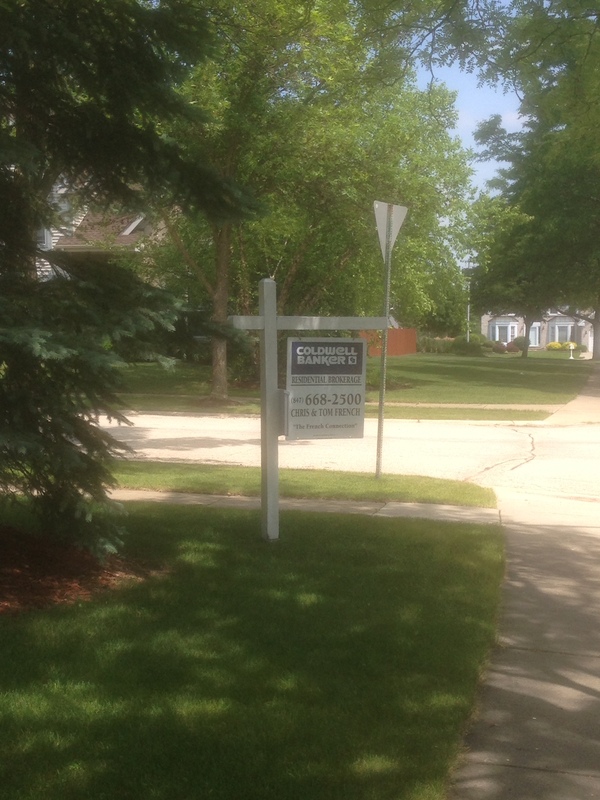 After doing some cosmetic improvements to our house in the spring, we decided to list it for sale in early June. Although both brokers we interviewed expressed optimism that the house would sell quickly, our last experience made us skeptical. Actually the prospect of a quick sale was somewhat daunting since we hadn’t even ordered our fifth wheel yet and didn’t know where we would live in the interim. Boy were we surprised when the first person to look at our house (even before it was actually listed on MLS) made us an offer that was too good to refuse. The buyer requested a close date of July 20th and, although we were able to push the close back to July 24th, our timeframe accelerated in a hurry. Based on comments found on various fifth wheel forums, there were two DRV dealers that regularly came highly recommended. 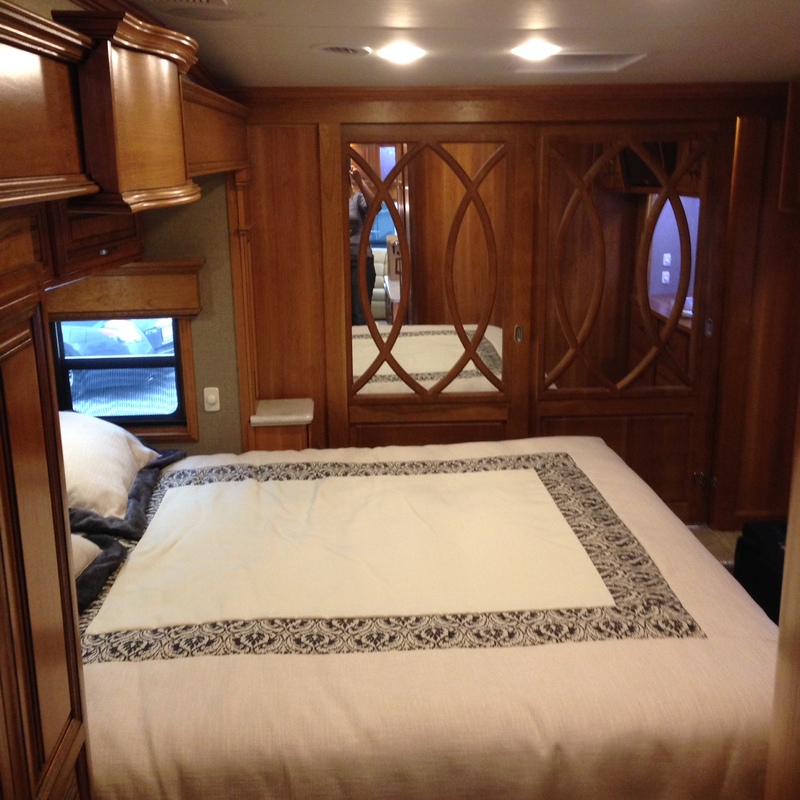 One was Rolling Retreats in OK and the other was RVs for Less in Knoxville, TN. We made a side trip to Knoxville while on our way to attend one of our daughters’ graduation in Nashville. We really liked what we heard from Ken Rife, the sales manager, and got a very reasonable quote from him. He let us know that the lead time on ordering a DRV Mobile Suites was about 13 weeks. When our house sold, we quickly finalized our order with RVs for Less in mid-June. 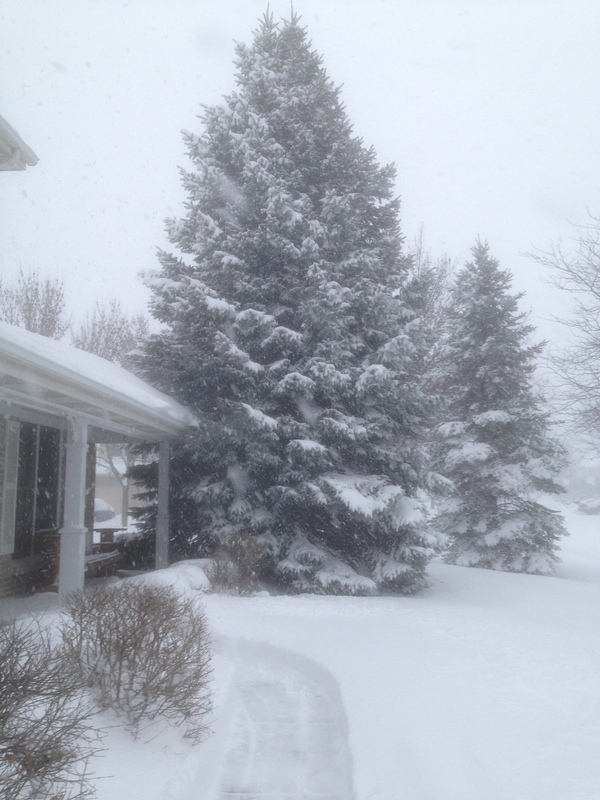 Based on the 13 week lead time estimate, we estimated that we get it around Labor Day. 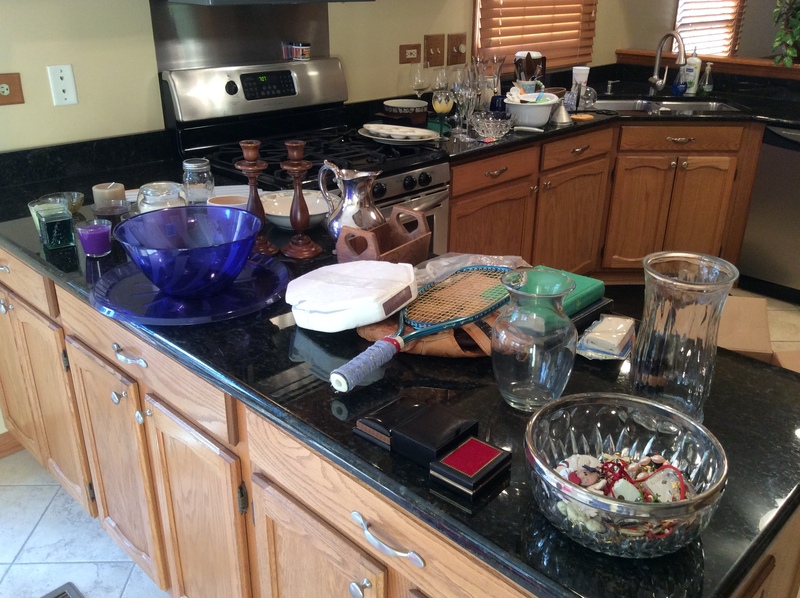 Even though we had downsized quite a bit when we had moved from MN to IL six years earlier, we still had a lot of things that we knew we couldn’t take with us in our new 400 square foot home. We returned all the keepsakes we’d been storing for our children and tried to talk them into taking more of our things (with limited success). Phil had begun exploring estate sale companies even before we had a buyer on the house. 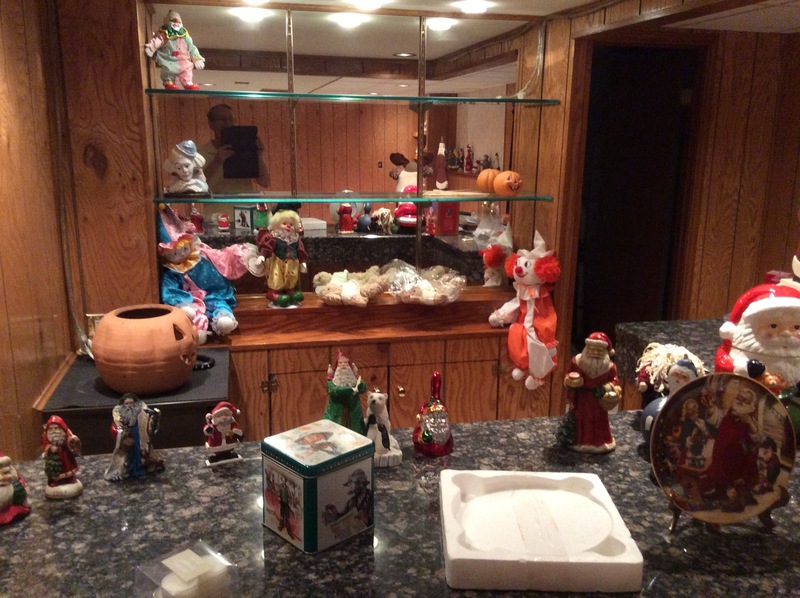 We knew that we would get a fraction of what our things had cost us but kept reminding ourselves what we had heard from other full-time RVers, that it is only “stuff.” We also realized that the timing of the estate sale was a bit of a Catch 22. We didn’t want to try to sell our home furnishings until we were somewhat sure the sale would go though. On the other hand, there would be only a short time window from when we felt comfortable selling everything to when the house had to be vacated. We didn’t want to move a lot of things into storage and have to try to sell them from a storage unit. We did rent a 5 x10 storage unit to hold those things we planned to take in our RV and some of our personal possessions that we decided to hold onto long-term. Our realtor was a big help in selling our furniture at good prices. Even after we accepted the offer on our house, she held a couple of open houses and got offers on a number of pieces of furniture with the understanding that the buyers would wait until early July to pick them up. She also listed our furniture with the other realtors in her office. We also listed quite a few pieces of furniture on Craigslist and were able to find buyers this way. 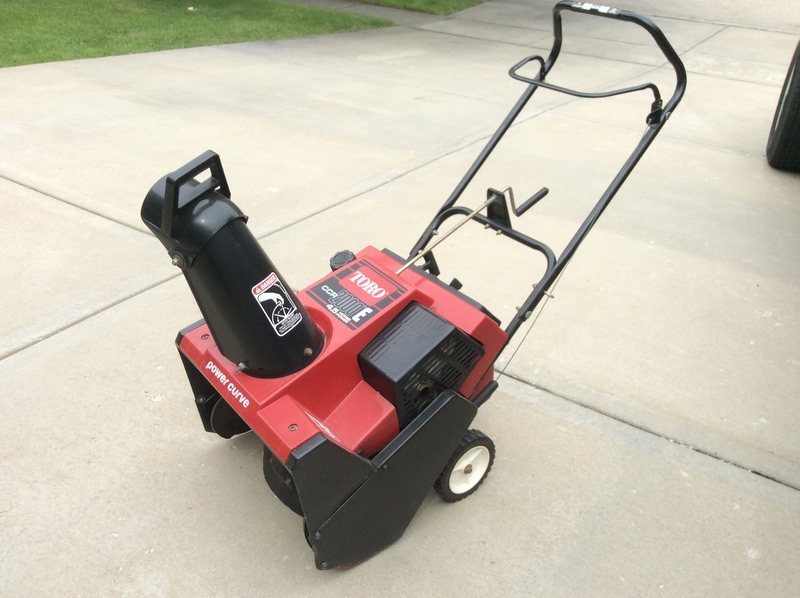 It was with great optimism that Phil sold his snow thrower. When Phil began contacting estate sale firms in late June to schedule our estate sale, we learned that the calendar was not our friend. Since July 4th fell on a weekend this year, none of the estate sale firms were scheduling sales for that weekend and everyone was already booked for the following weekend. The earliest sale we could schedule would end on July 19th and, at that point, the buyer was still wanting to take possession on July 20th which would not have given us time to get rid on any unsold items. We decided to contract for a four-day estate sale from July 16-19 and negotiated with the buyer to push the closing date back to July 24th. The estate sale firm had given us the name of a charity who supposedly would come and get our unsold things after the estate sale ended. Unfortunately this also turned into a Catch 22. The charity wasn’t willing to commit to sending us a truck on the day after the estate sale unless they knew what we had for them to pick up and, obviously, we couldn’t predict what would remain unsold. Fortunately, the estate sale went very well and we boxed up the unsold items and delivered them to Goodwill ourselves. 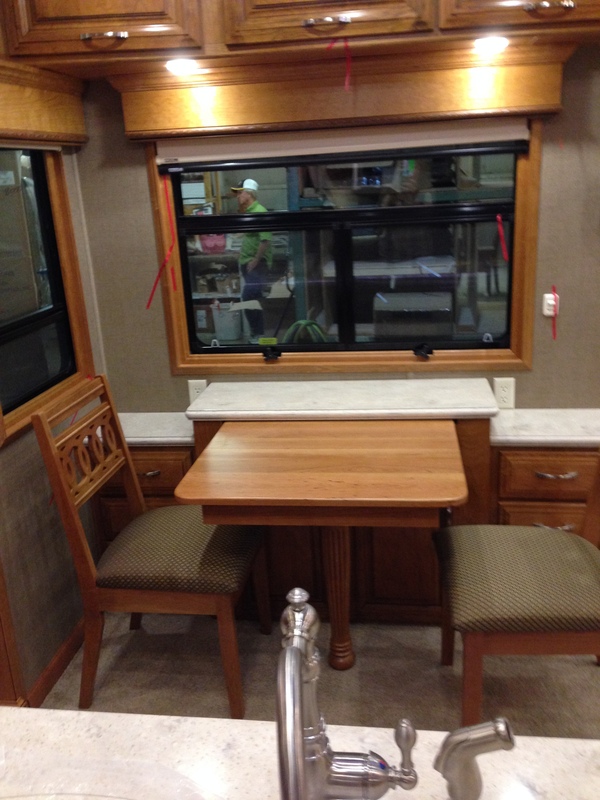 With the estate sale scheduled to begin on July 16th and the fifth wheel not expected to be ready until Labor Day, we faced the prospect of being homeless for a while. Initially we considered subletting on apartment for a couple of months. After looking at sublet opportunities on Craigslist, we gave up on this option. We couldn’t find any sublet opportunities that were as short-term as we thought we needed and it would have required us to hold on to some of our furniture to furnish the sublet unit. We also looked at furnished apartments but these were almost all owned by corporate housing firms and were very pricey. Finally Phil found an extended stay hotel that was a short distance from our house, provided the furnishings we would need, and was reasonably priced. We moved in on July 12th to enable to estate sale firm to begin prepping for the sale. We initially expected to be leaving on August 30th. At first the stay in the hotel went by quickly. The house sale closed on July 24th without too many last minute issues. Jan continued working until the end of July. Phil had a contract assignment that ran until mid-August. We believed we were only a few weeks away from starting our new life. Wrong! In mid-July, we had been contacted by DRV and told that they were making some mid-year design changes. However, they never mentioned that this would delay the delivery schedule. Since we were still expecting delivery around Labor Day, we were surprised to learn in mid-August that these design changes had led to delays. Our unit was now scheduled to come “off the line” on September 8th but would then have to be sent out for painting and then delivered to the dealer in Knoxville. The new estimated delivery date was either the last week in September or the first week in October. We scheduled a DRV factory tour on September 4th and got to see our unit in progress. Although it was great to be able to walk around inside the rig, it was obvious that there was still a lot of work left to be done. Near the end of September, we finally got a firm delivery date of October 12th, three months after we had moved into our extended stay hotel. On September 30, we made a quick trip to Nashville to deliver keepsakes to three of our kids and to put long-term storage items in a 5 x 5 storage unit closer to family. We placed numerous orders with Amazon for things we knew we would need for our RV life and had them shipped to our son Jarrod’s address. We returned to Schaumburg for four more nights before emptying out the balance of our storage unit, leaving Illinois on October 8th and heading back to Tennessee to finally get our RV. After spending the weekend in Nashville visiting family and friends, we headed to Knoxville with our vehicles loaded with everything we thought we would need for the next week. Since we would be returning to Nashville within the week, we left much of our stuff in the storage unit. 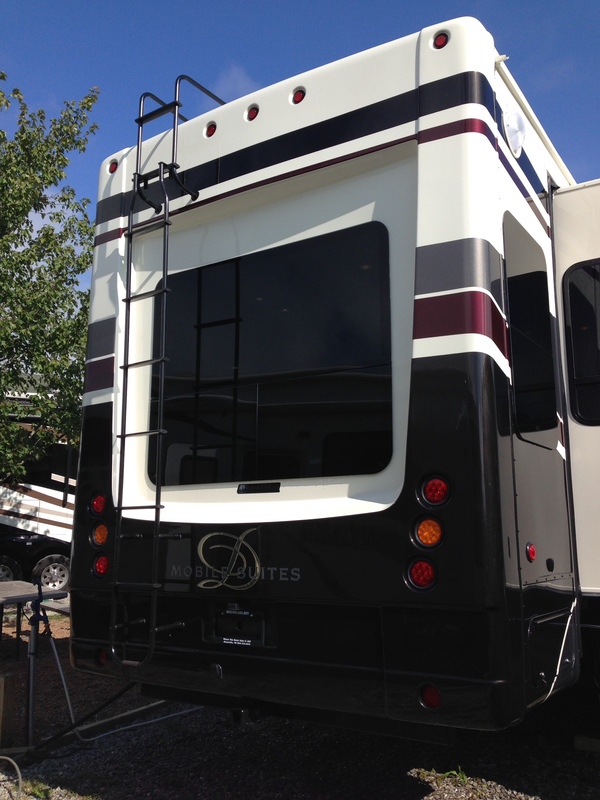 On Monday morning, October 12th, we arrived at RVs for Less and became the proud owners of our Mobile Suites fifth wheel. We were greeted by Alan, who would spend the next three days answering our questions and getting us more comfortable with the workings of our new home. 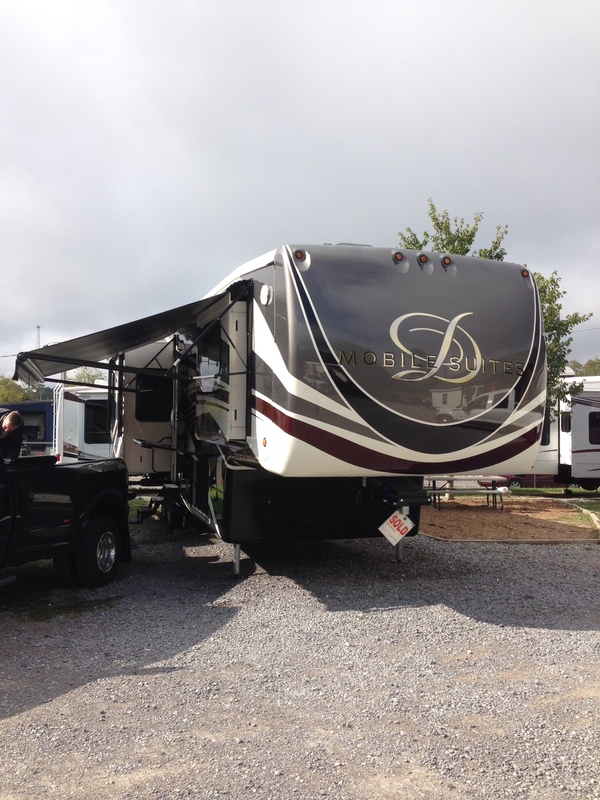 We were able to pull our vehicles up next to our RV and began to move into our new home. Although there is plenty of storage in the Mobile Suites, finding the right place to put things was a challenge. Remembering where we put them was an even greater challenge! Alan was very patient with us as he tried to show us how things worked even though there was very little room to walk between all our boxes. We were glad we had done so much research in advance as this made the learning curve much less daunting. We were given a worksheet to use to note any questions we had or things that needed to be fixed. Fortunately, there were only a couple of minor repairs that needed to be made. The bedroom closet door needed to be realigned and the catch on the LP tank tray needed to be adjusted. We had ordered AGM (no maintenance) batteries which had not yet arrived but they were installed later in the week. Since Karen, the owner of RVs for Less, was leaving on vacation Monday afternoon, we met with her to finalize the paperwork and hand over the big check. Ken also stopped by to greet us and make us feel at home. On Tuesday, Alan gave us our driving lesson. He taught us how to hitch and unhitch the fifth wheel and then took us down the road. Initially he had Phil just drive up and down the highway near the dealership but then he took us out on I-40 and to a mall with a fairly empty parking lot. 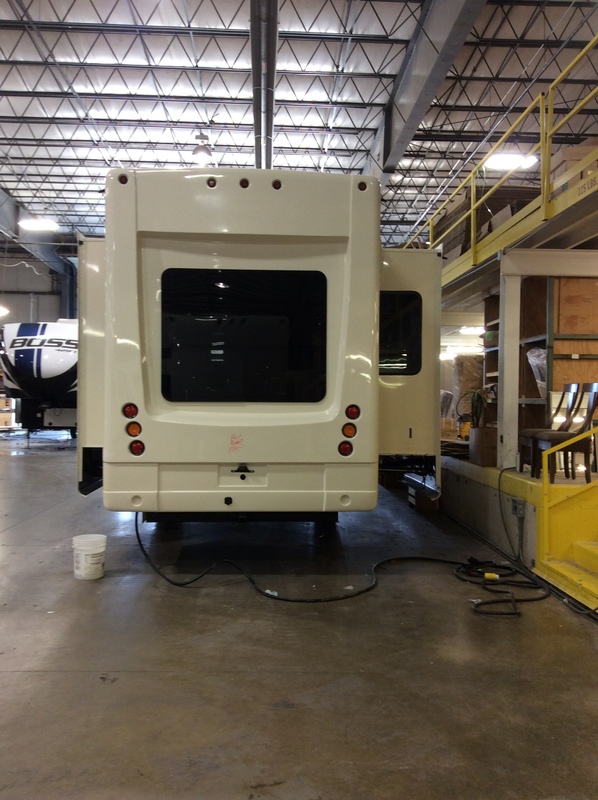 We practiced backing up the fifth wheel, which is much more challenging than going forward. Jan, although hesitant to drive the rig out on the road, took her turn driving it on the lot and backing it up. Although the lesson we got from Alan helped our confidence, we were both glad we had already signed up for additional driver training. We had originally planned to only stay on the dealer’s lot for two days and then the dealer would pay for us to spend two nights at a campsite in Pigeon Forge, TN. However, when we ran into problems with our DIRECTV setup (warranting a separate blog post), Ken told us we could stay on the lot for as long as we needed. He said the record had been 11 days so the four nights we ended up staying wasn’t too bad by comparison. We were given a key to the dealership’s gate so we were free to come and go after business hours. One of the challenges caused by not having our DIRECTV access was that we had to find a place to watch the Chicago Cubs defeat the ST. Louis Cardinals in the NLDS playoffs. We found a nice sports bar in Knoxville and camped out there two nights watching the games. In our hurry to get to see the second game, we took off without the gate key and had to call Ken at home to arrange to be let back through the gate. Phil had made arrangements for us to go through two days of RV Driving School in Nashville on the weekend of October 16 and 17 so we needed to head to Nashville on Friday. The DIRECTV receivers that had been expected earlier in the week finally arrived around 3 pm on Friday. 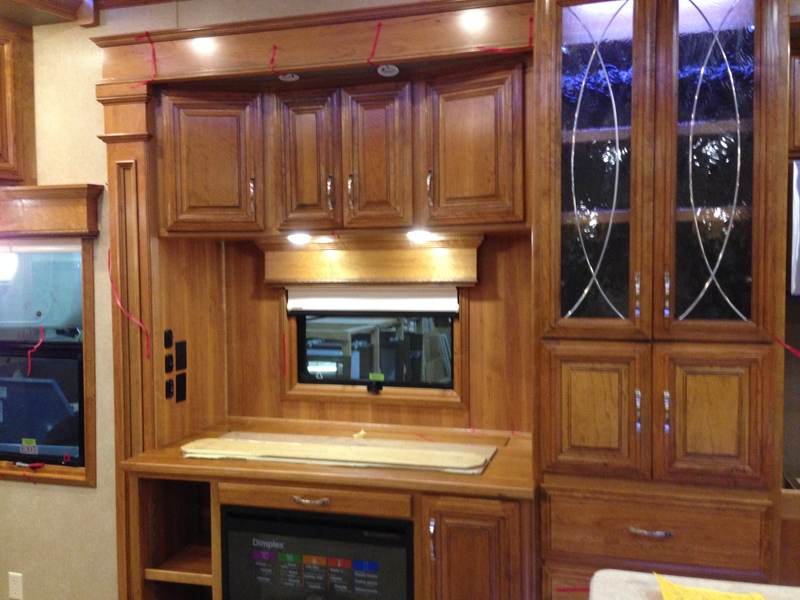 Kennedy, the electronics technician for RVs for Less, installed the hardware but, despite numerous phone conversations with reps from Winegard and DIRECTV, we couldn’t get the TVs in the bedroom and outside to work. Phil finally decided that these issues would have to wait until the following week and we prepared to leave the dealer’s lot. We said our goodbyes and hit the road to Nashville. It was nearly 6 pm when we left the dealership so most of the 3-hour drive was in the dark and on a hilly and winding I-40. Although the trip was tiring, it was uneventful and we pulled into our campsite in Nashville around 9:30pm. Since we had driving school at 9am on Saturday, we didn’t even bother to unhitch and went right to bed. We had never had satellite TV before so we really didn’t know what we were doing. When we ordered our Mobile Suites, we ordered a Winegard rooftop pop-up satellite dish for DIRECTV since we had read that DIRECTV made getting high definition (HD) reception much easier than with Dish. Since we didn’t have a home DIRECTV account, the DIRECTV website said we needed to open our DIRECTV account by contacting Winegard. Other than buying the satellite dish, we didn’t know that we needed any additional hardware. We learned our mistake when the folks at RVs for Less asked us on our first afternoon if we had our DIRECTV receivers for them to install. They recommended we order a regular Genie for the living room and, for ease of installation, two wireless mini-Genies for the bedroom TV and the outside entertainment center. Phil called Winegard Tuesday morning and ordered these receivers. The Winegard customer service person told us that DIRECTV would charge us a $99 installation fee for a wireless receiver (vs. no additional fee for a wired receiver), even though they wouldn’t do anything more for a wireless installation. The Winegard rep told Phil she would write the order for two wired mini-Genie receivers but would ship us wireless mini-Genies. She said that, when it came time for the dealer’s installer to activate the DIRECTV service, we could simply call DIRECTV and they could just change the order without triggering the $99 installation fee. Phil ordered the receivers from Winegard and had them shipped to the dealer via Fed-Ex two-day delivery at a cost of $25. Next-day delivery would have cost $70 and, since it was only Tuesday morning, it seemed that the receivers would arrive by Thursday morning. We would later learn that this was a mistake as the receivers didn’t ship from Winegard until Wednesday and didn’t arrive at the dealer until 3 pm on Friday. Since we needed to be in Nashville for driving school at 9 am on Saturday morning, our stress levels were running high. 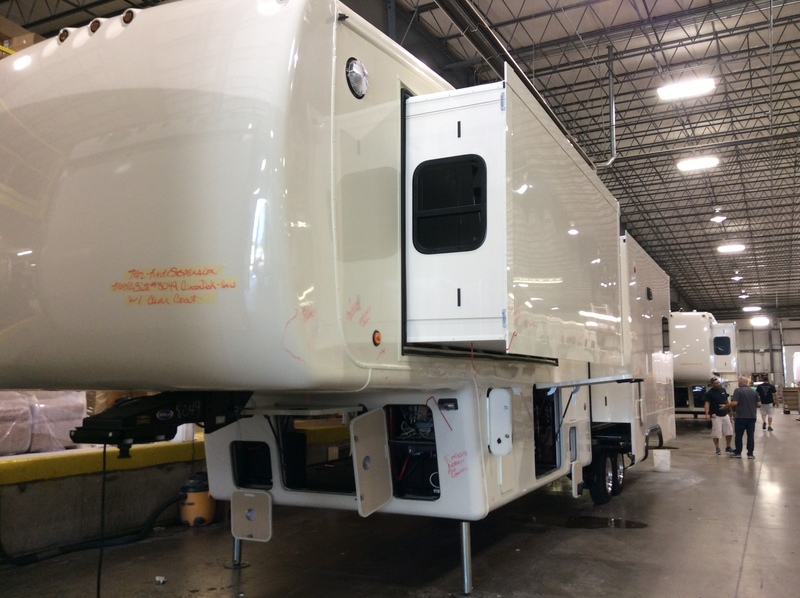 When the Fed-Ex truck finally arrived, Kennedy, the RVs for Less technical installer, got right to work installing the equipment. The installation went pretty well but required a quick run to Walmart to get a splitter. We also learned that we would need a couple of power strips. Fortunately we had packed a couple of power strips in the boxes that were still in our Nashville storage unit. Once it came time to activate the installation, we ran into a major snag. The Winegard rep was able to walk Phil through activation of the TV in the living room with some difficulty (mostly due to confusion as to whether Phil was supposed to be pushing buttons on the TV remote or the DIRECTV remote). However, when it came time to try to activate the two wireless receivers, things went very badly. The DIRECTV rep couldn’t activate the two receivers because the hardware didn’t match what was ordered. Despite Winegard’s assurance that DIRECTV could simply change the order to reflect the wireless receivers, the DIRECTV rep insisted that they couldn’t change the order. After Phil had multiple phone calls with both Winegard and DIRECTV reps, the two parties finally decided to have a conference call to find a solution. Ultimately, Phil heard back from Winegard confirming that they would need to correct the original order. Since it was the end of the workday on Friday and we needed to leave for Nashville, Phil suggested that they resume the effort on the following Monday. Fortunately, the campground in Nashville had cable TV so we were able to watch the Cubs games that weekend even without the satellite (after a quick run to Walmart to buy a 50’ cable). Phil heard back from the Winegard rep on Monday morning. She informed him that we would be charged a $149 fee that included the $99 installation fee and a $50 change fee. Due to Winegard’s role in necessitating the required change, they offered to rebate us the $50 change fee. On Monday afternoon we had a lot of family visit our campsite in Nashville so final DIRECTV activation was delayed until Tuesday morning. On Tuesday morning Phil reconnected with the Winegard rep and attempted to activate the two mini-Genie receivers. We managed to connect the bedroom TV through trail-and-error (and Jan’s reading of the messages on the TV) more than from the guidance received from the Winegard rep. Phil decided he could complete the activation of the outside TV on his own by replicating what had worked on the bedroom TV. This is when we learned the difference between wireless remotes and radio frequency remotes. It turned out that, for the wireless remote to work, we had to have a direct line of sight between the remote and the receiver. Although that did necessitate opening the door to the containing the receiver for the remote to work, it was workable cabinets in the living room or bedroom. There was not an easy solution for the outside TV since the receiver had been installed inside a cabinet by the kitchen table. Phil completed this activation by standing in front of the outside TV and instructing Jan by cell phone step-by-step as to what buttons she needed to push on the DIRECTV remote. Since he was convinced that there must be an easier solution, Phil called Winegard again but they confirmed that there must be a direct line of vision between the remote and the receiver. As crazy as this was, it worked and we managed to have satellite TV reception on all three TVs. Later on, Phil came up with a jerry-rigged solution for the outside TV. He found that the DIRECTV receiver had a long enough power cord that he can pull it out of the dining room cabinet and put it on top of the breadbox by the dining room window. Now, when standing by the outside TV and pointing the remote toward the dining room window, the remote is able to control the DIRECTV receiver. It’s not ideal but a lot better than having to run in and out of the RV to change the channels.